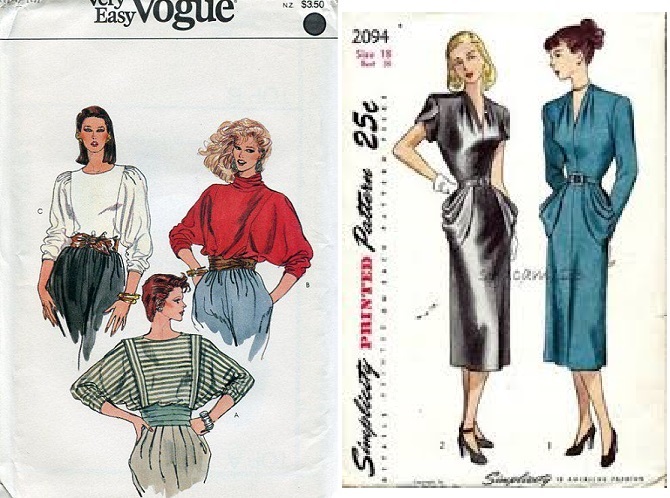 Post WWII was an interesting time for the fashion world to dive into new styles, new fabrics, and new idealized silhouettes. While some things were changing, some things were also staying the same. The dress presented in this post is from 1947, a year caught in between the famous Dior “New Look” and the lingering classic 40’s appearance. 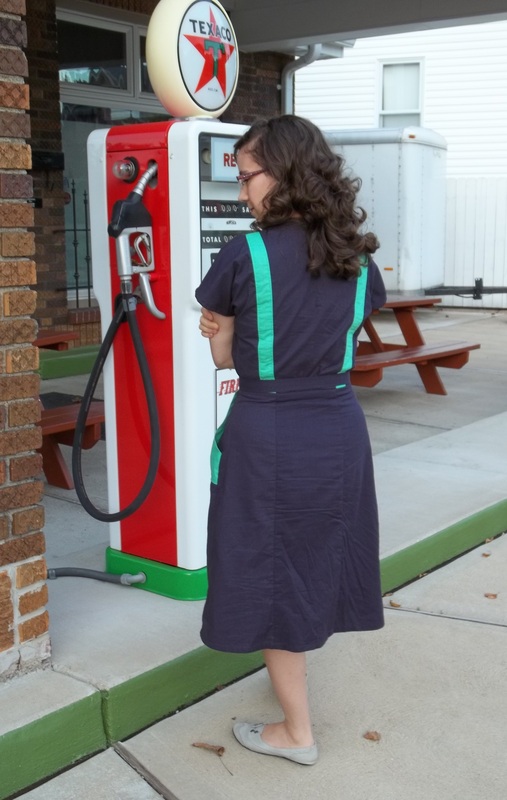 I made this dress a little bit of both worlds but still oh-so-very 40’s – it is the classic comfort of basic cotton and accentuated shoulders, together with the boldness of dramatic color-blocking and handy, yet interesting details. 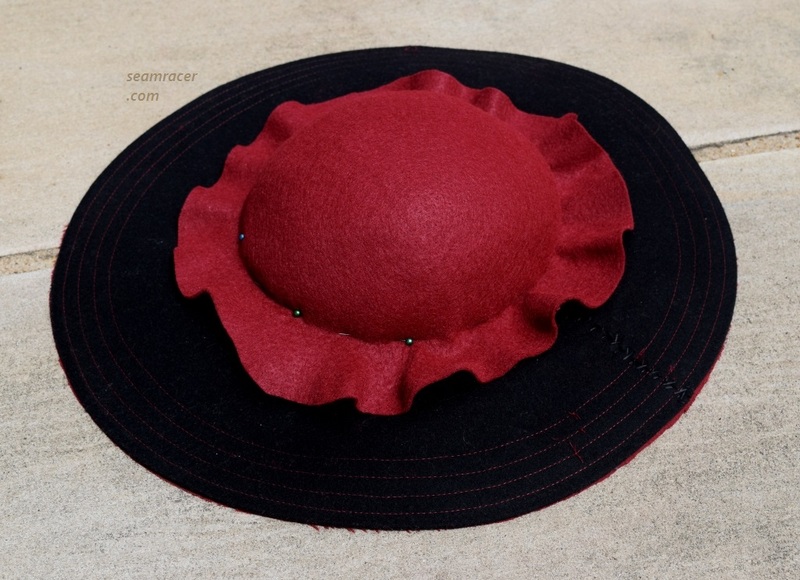 This is another “Agent Carter” Sew Along post. FABRIC: A basic 100% cotton broadcloth was used for the entire dress, bought from Hancock Fabrics. The main color, a deep purple, is slightly stiffer than the contrast color, a bright Kelly green. 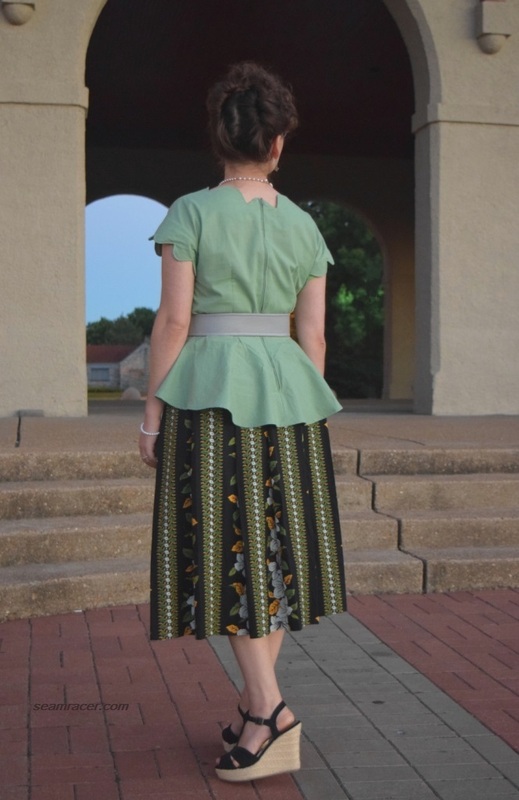 NOTIONS: I had bought the bias tapes, zipper, and thread needed when I had picked out the fabric, so that everything was on hand when the dress was finally put together. Half of the needed bias tapes were on clearance – ya hoo! – bought for only $1. TIME TO COMPLETE: Not long at all (in my estimation), at total time of about 8 hours, stretched out over three evenings. 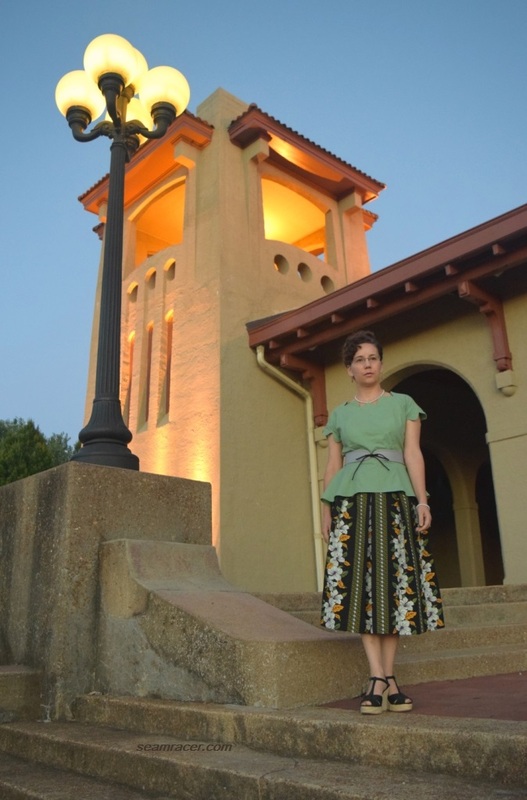 My dress was finished on September 26, 2014, and worn out to go vintage shop browsing the very next day. 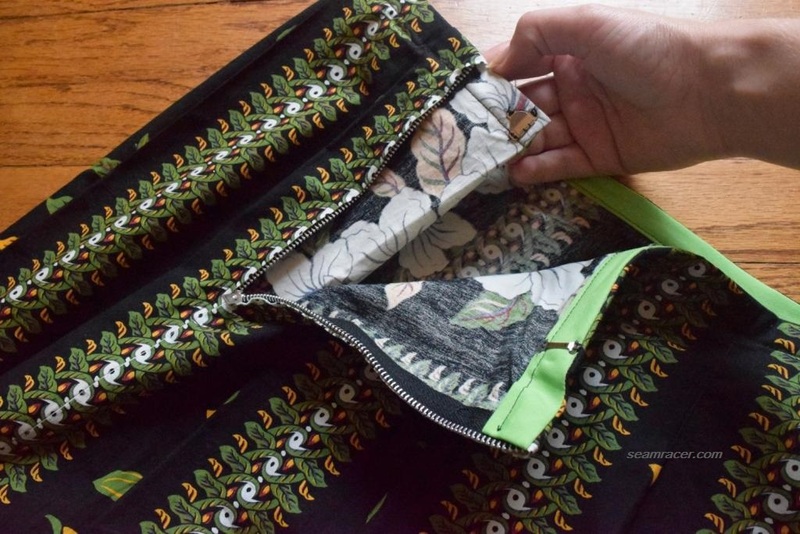 THE INSIDES: Everything is nicely covered in bias tape, and the only seams left, the suspenders, are covered on the inside by being lapped over with another mirrored piece. 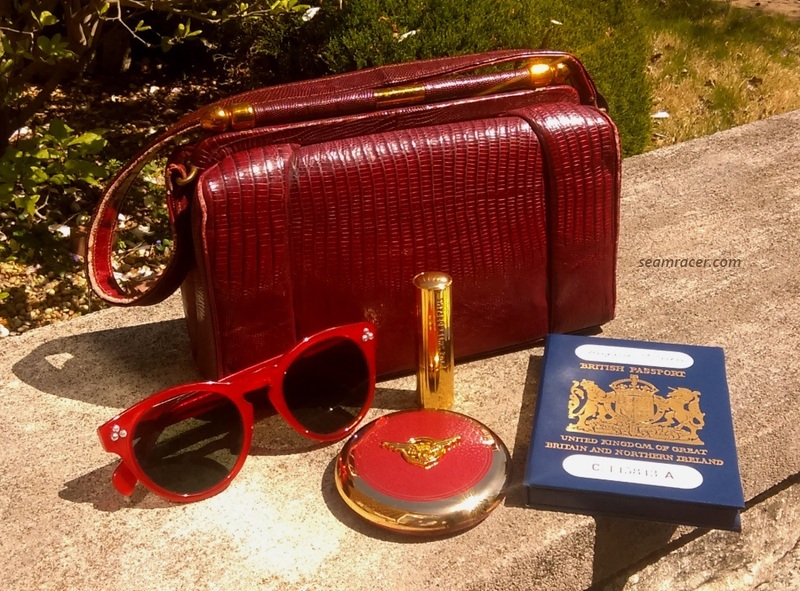 Smooth and comfy on my skin! TOTAL COST: I don’t really remember exactly anymore, only I think it might have cost me around $15 to $20, which is a little more than expected on account of buying double amount of the purple cotton (I’ll explain later). 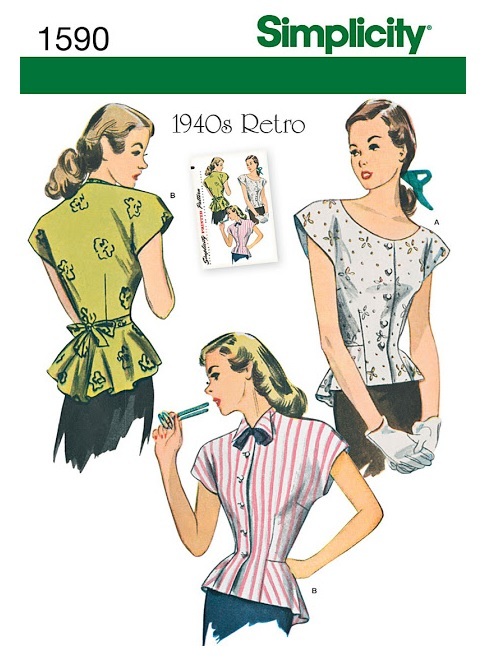 The split neck and the pocket placement and styling is classic of ’47/’48. 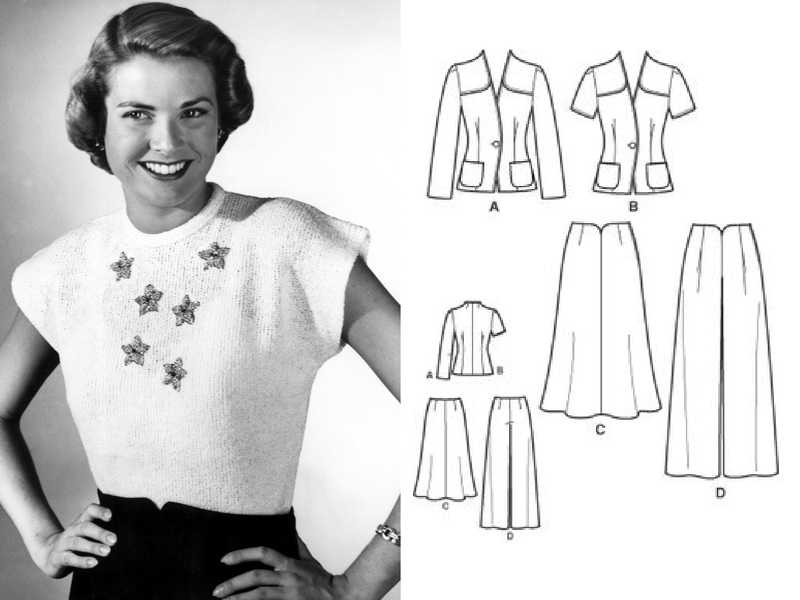 The hips began to be emphasized more for the first time in the decade – an early way to ease into the overly-exaggerated hips of Dior’s “New Look”, unveiled in 1947. 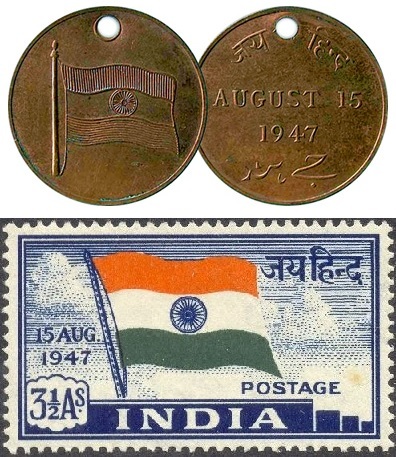 The hip emphasis of ’47 and ’48 patterns is still quite subtle and very beautiful, in my opinion. 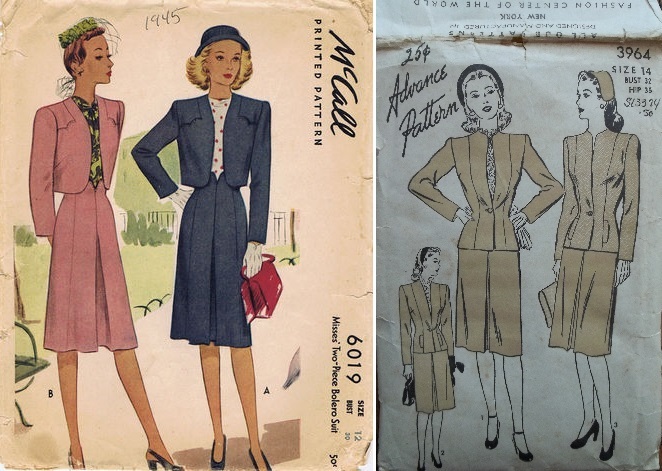 I love the way that pockets were something more to show off externally and incorporate into the style of the outfit, rather than merely creatively hiding perfectly placed pockets, highlighting only with an external flap or such, like in most 1946 and earlier patterns. 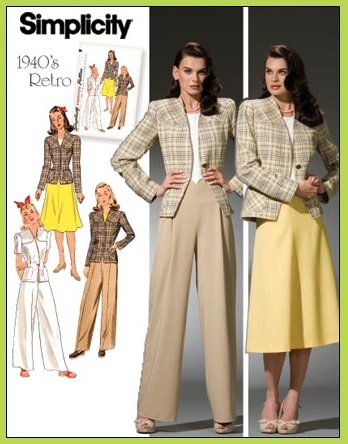 Here below are some sample 1947 and 1948 patterns (which I do not own) to prove an example for my point. 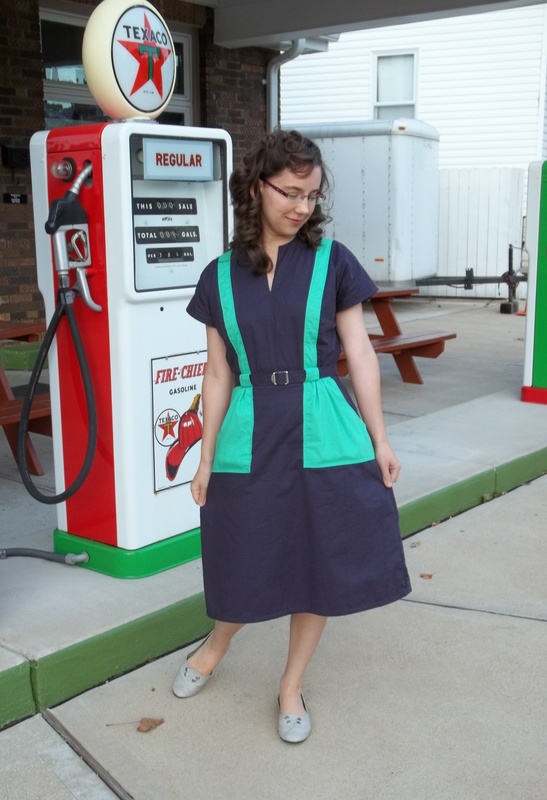 A style very similar to my ’47 dress, with fake suspenders, also apparently came back in the 80’s. 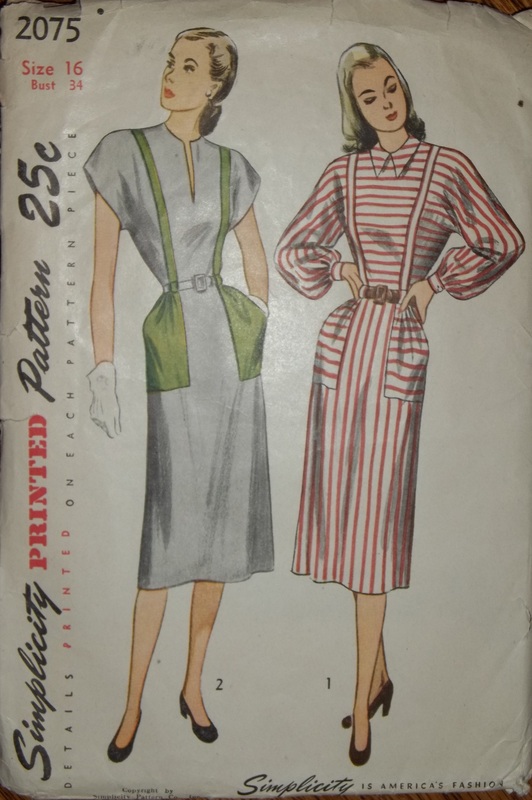 My 1947 Simplicity #2075 pattern gave me the opportunity for some fun color pairing or stripe contrasting. I chose the color blocking, short sleeved option this time, but I can’t wait to make a wintertime long sleeved dress out of some bold stripes, just like on the other model in the envelope cover (see above). 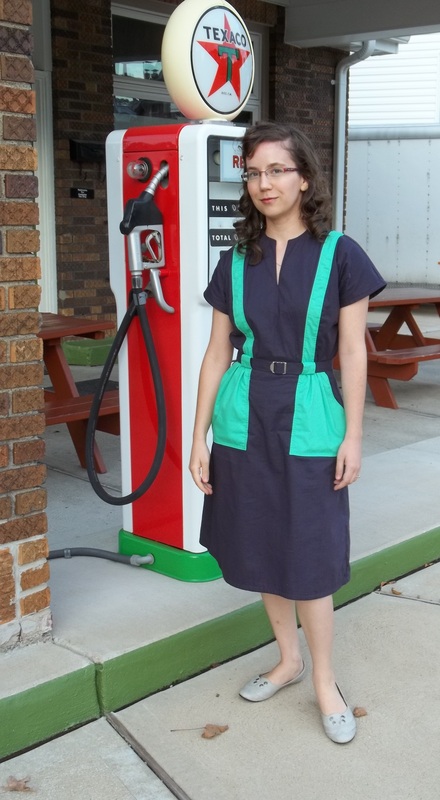 I tended to go for the bright apple green color for the pockets and “suspenders”, no doubt on account of the cover. 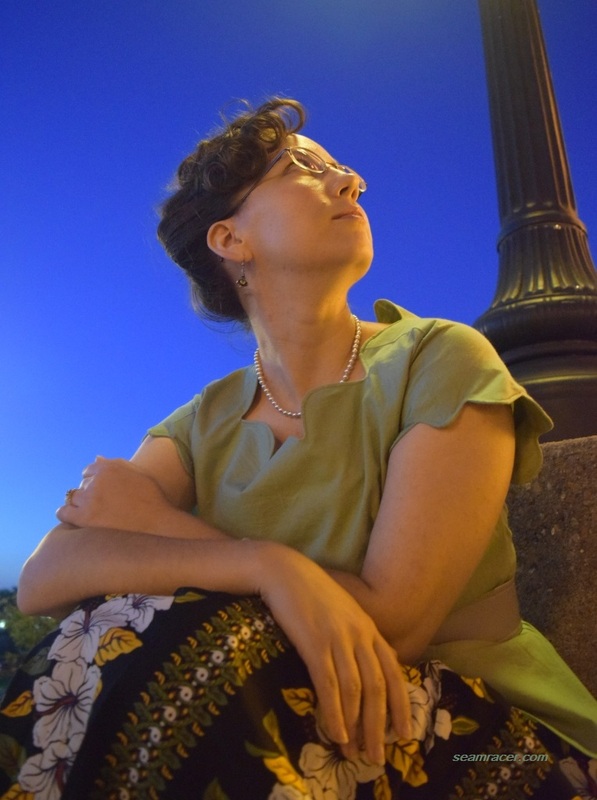 The thought of having a dress with so much solid color of grey would not be very complimentary on me, so I paired the bright green with a very dark, deep purple. Using cotton broadcloth made my choice of these two colors quite a challenge, because Hancock Fabrics has so many colors and different tones to choose from. My second leg is really there, just hidden! 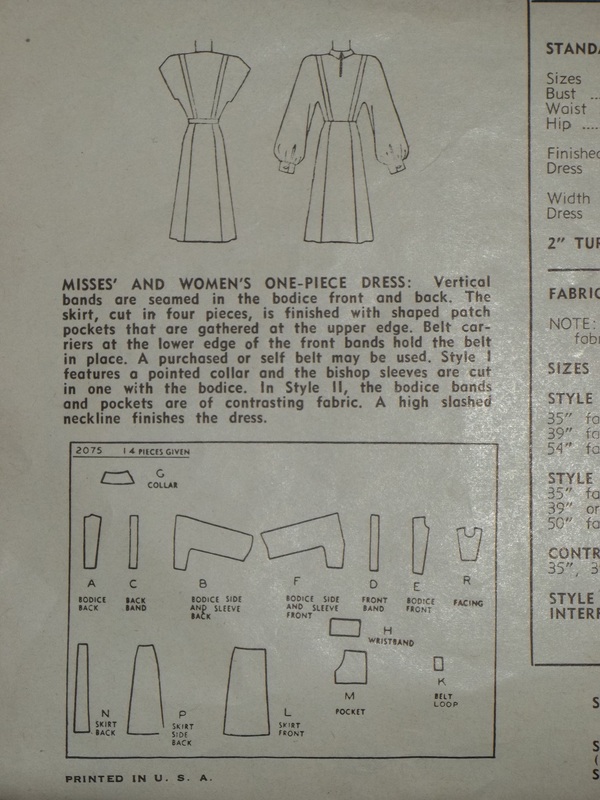 The fact of matter is, my choice in color, fabric, and pattern for this 1947 dress is technically not a new one. 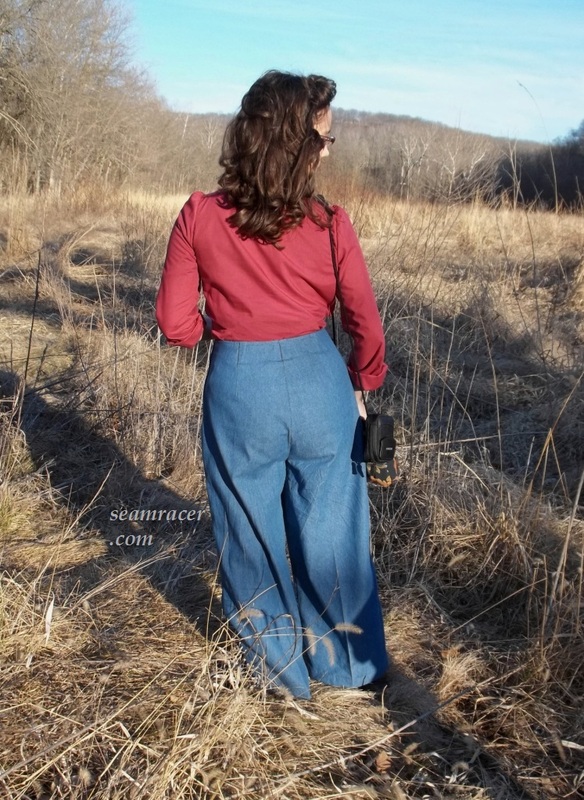 Simplicity #2075 pattern is one of the very first old patterns I bought in 2011 when I discovered the vintage world. 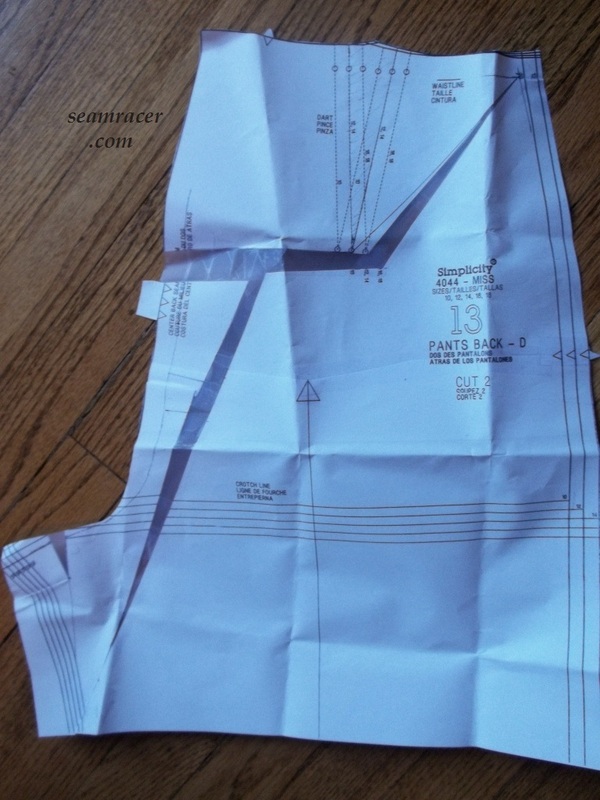 I knew wanted to make the dress, but d idn’t pick out the fabrics until 2012. This dress was cut out and ready to be sewn up for Lucky Lucille’s 2013 “Sew for Victory” sew along, but that didn’t happen so the next year I made sure not to put off this project any longer. 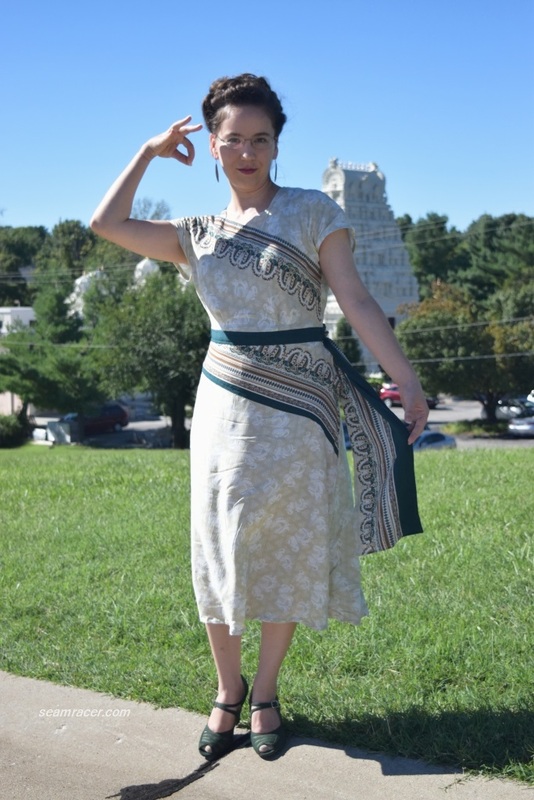 Sometimes waiting so long for the finished product of a project really makes you amazed and extremely happy to finally be able to wear it, although there is the possibility for it to be totally neglected or even loose it’s “new” and “exciting” luster. Even still, I am very happy to see my idea completed after all this time. 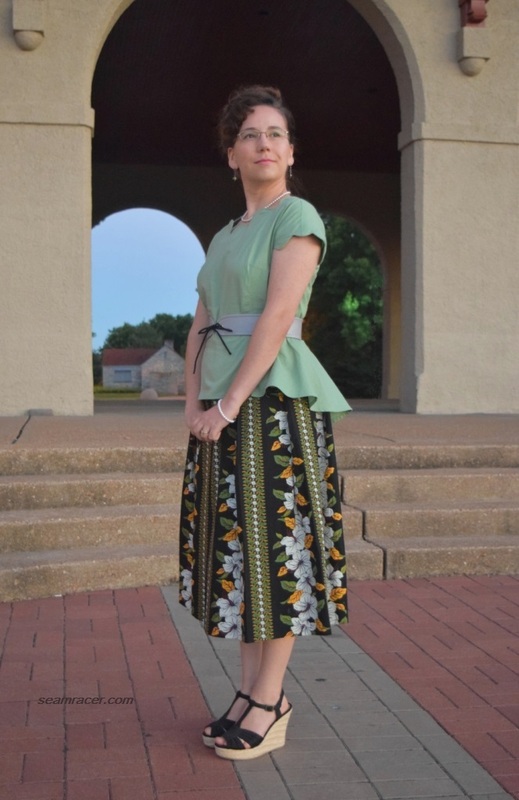 My only regret is that I wish I had bought slightly more fabric, because I had to shorten the hem to mid-1940’s below knee length, instead of the proper mid-calf fall of the late 40’s skirts and dresses. 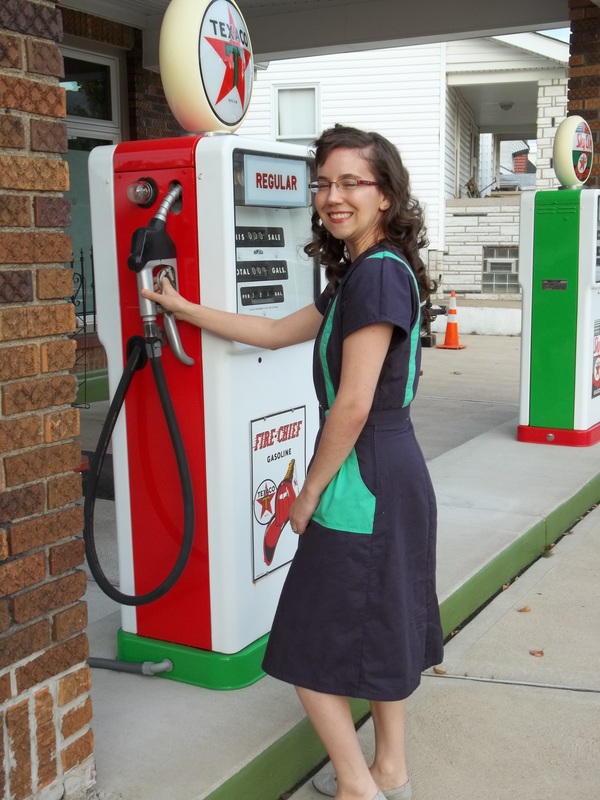 I made the construction of my fake suspender dress just a bit harder for myself so as to get paid off for it later by having a nicely finished project. Firstly, all of the purple pieces are double layered, because a single layered seemed too see-through…this is why I bought double amount and spent a bit more money. The double-layers made the seams quite thick for my machine to sew over, especially since all the seam edges were covered in bias tape. This purple cotton broadcloth is tightly woven! 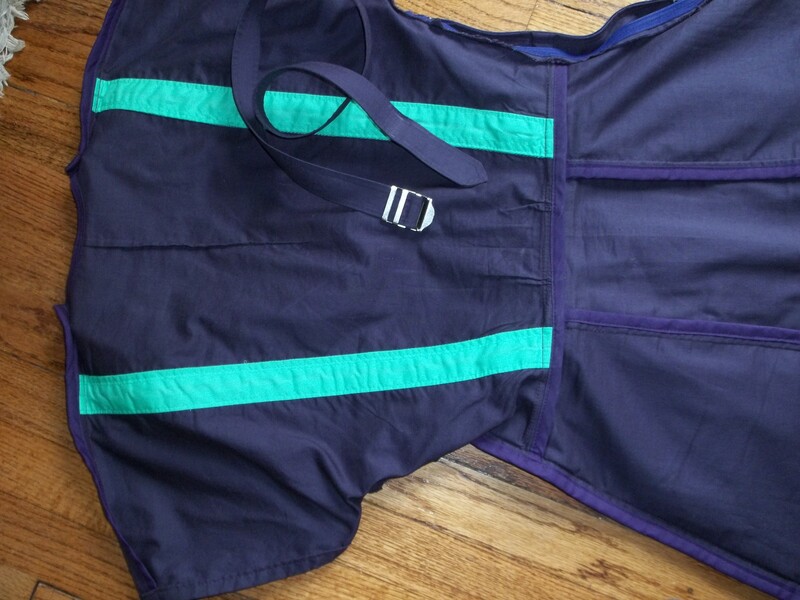 Secondly, I doubled up on the suspender and pocket pieces to have the insides covered and stable, and to give a deep toned color for a dramatic contrast to the purple. 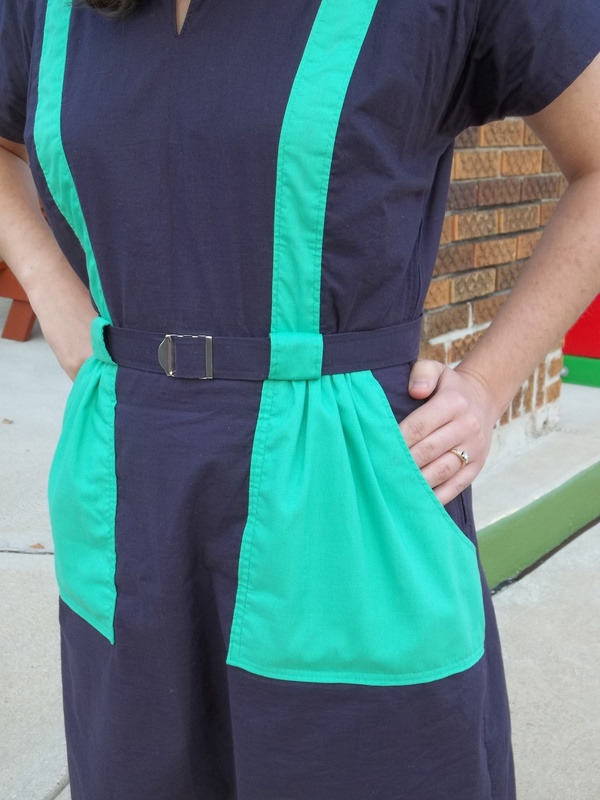 Now, just to clarify, the bright green fake suspenders are actually a separate piece that gets sewn on and connects the sleeve/side bodice section to the middle bodice section. The suspenders are not just applied bands! (See pattern back picture.) Neat, huh? 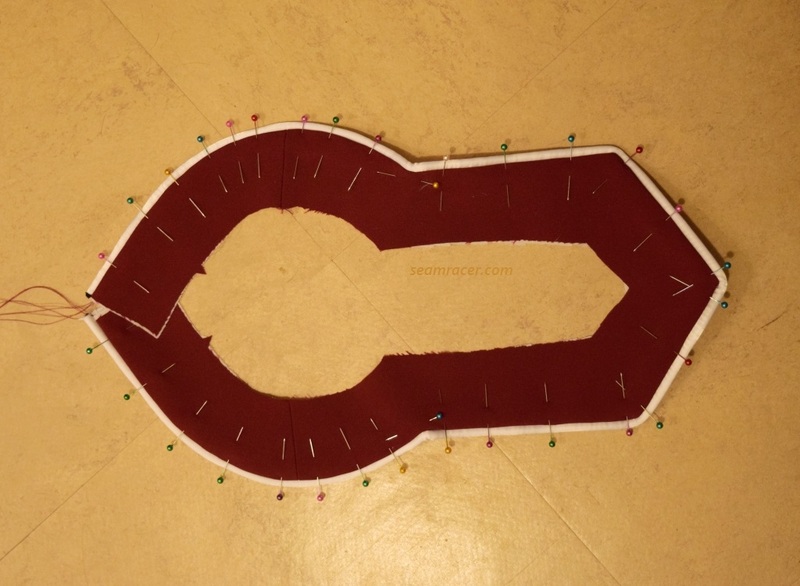 Lapped onto the inside of the suspender piece you see from the outside, is a second piece sewn down. 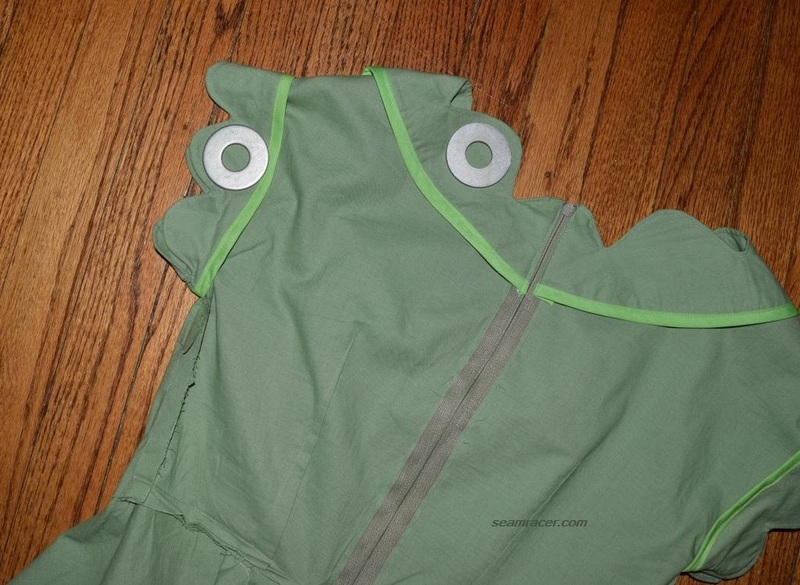 The pockets were supposed to (as per the instructions) just have the opening edge turned under with bias tape. 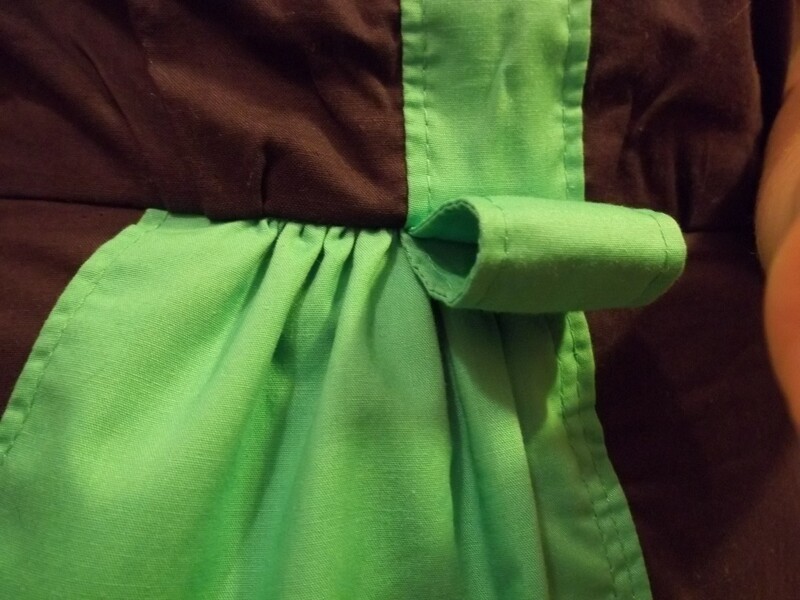 However, I treated the second pocket piece like a facing, sewing them together at the opening curved edge, then turning right sides out and top-stitching for a smooth finish, before the rest of the pocket was sewn on the dress like instructed. 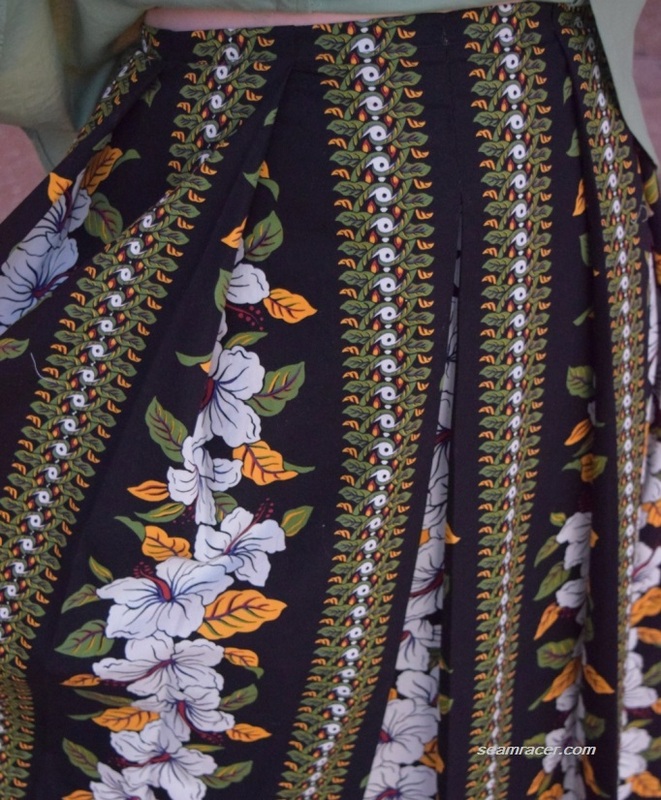 Besides the interesting features of the dress which I have mentioned already, there is a very curious detail under the pocket area which unfortunately is completely hidden. 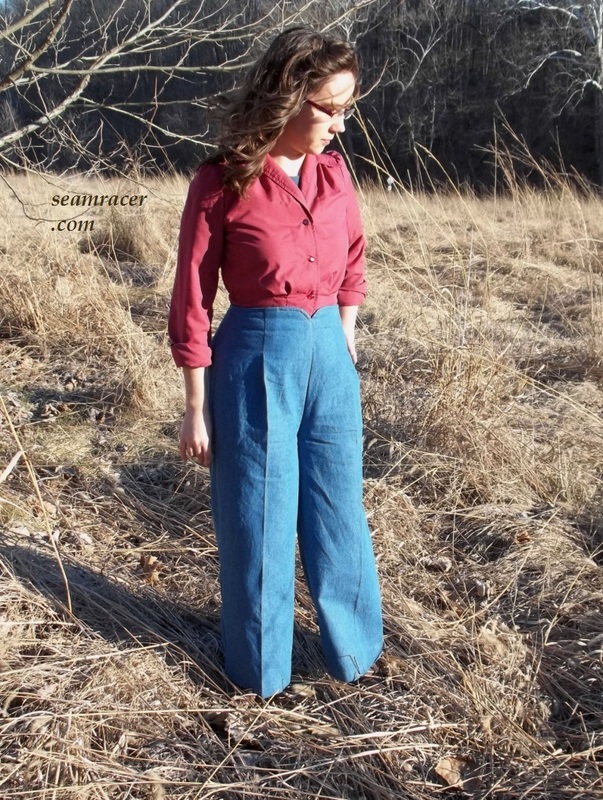 At the upward arch where the pocket comes to join in the dress’ waistband, there are a handful of tucks on either side underneath, on the purple cotton. 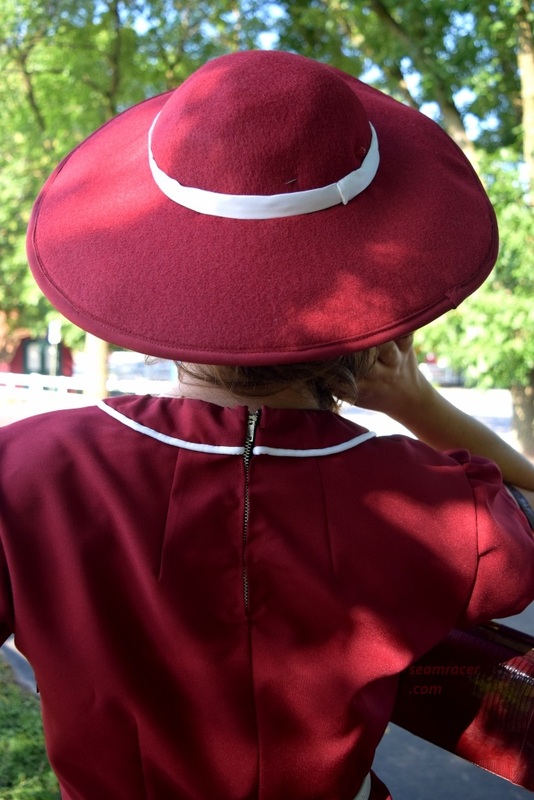 Then the top strip gets gathered and sewn right over those tucks…why?! 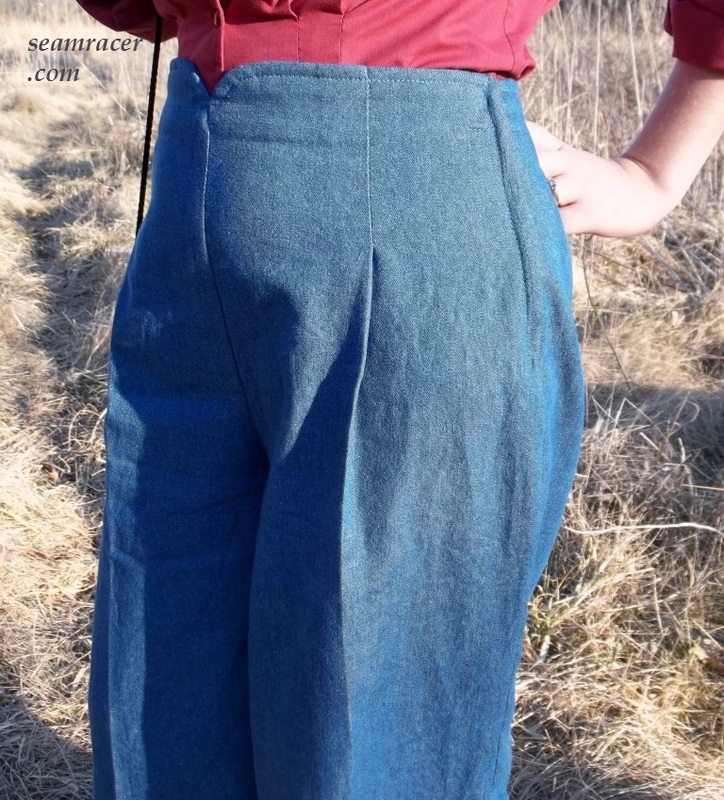 I thought the tucks looked good (hated to cover them up), and they sure make that spot a bit bulky, especially with the pocket top gathered, there too, and belt tabs sewn in that same spot, too! 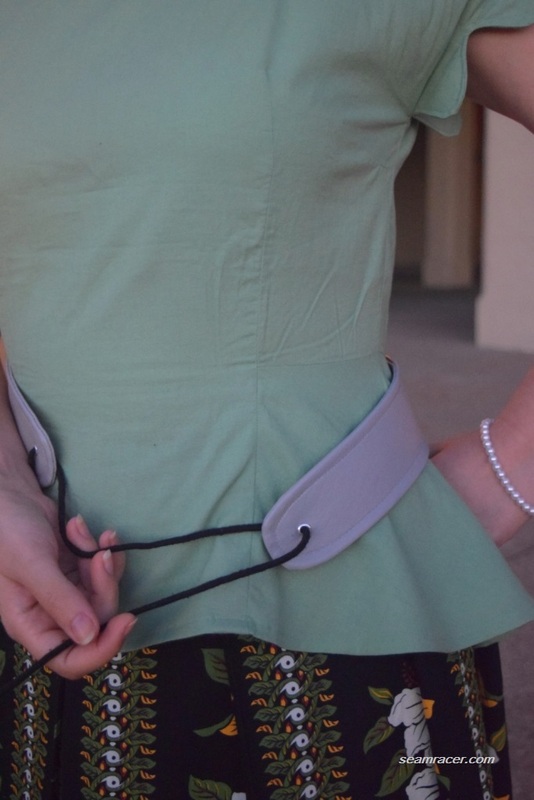 That’s right, this dress also has contrast green belt carriers, like big free hanging loops. 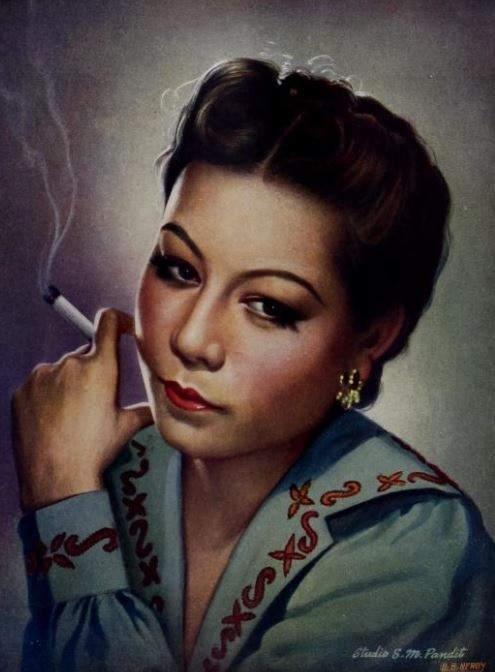 I love the late 40’s Post-War fashion – so elegant and fetching and intricate. 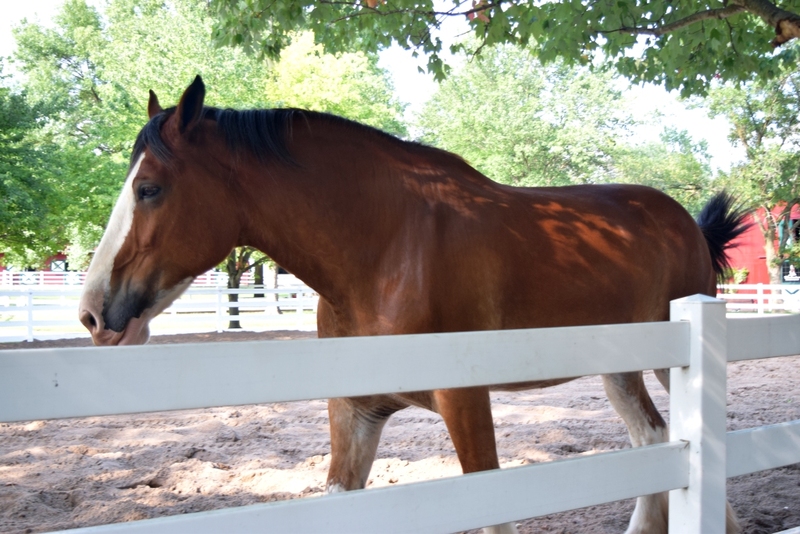 You can see how the fake suspenders wrap over my shoulders…however, I blinked! 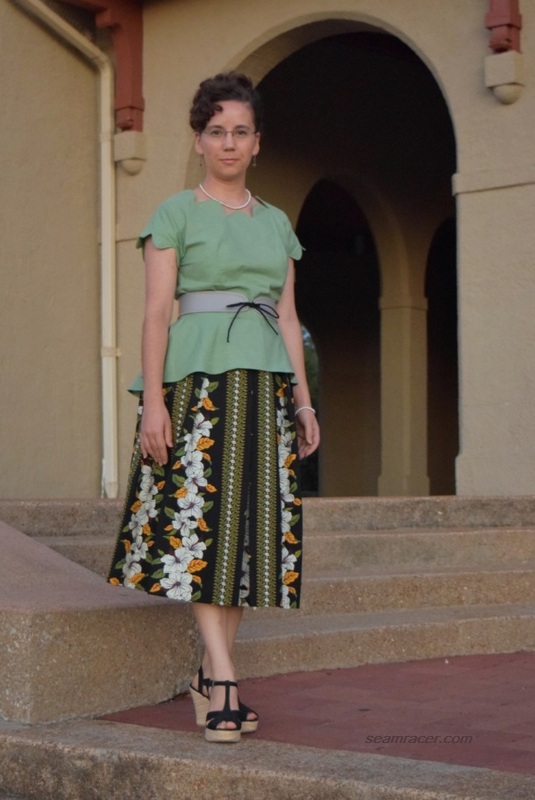 Keeping the whole color-blocking theme going, I decided to make my own belt out of the same deep purple cotton as for the rest of the dress. 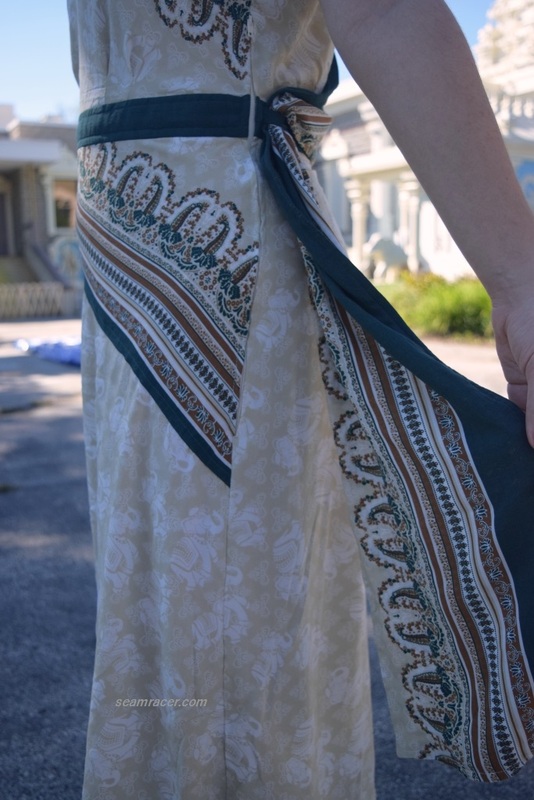 The belt pattern included with the dress pattern was the one I used. Each time I make a belt I seem to make it differently in order to find my favorite, or at least the best, way. This time I experimented using “Stitch Witchery”, and I must say I am ecstatically pleased. It was easy, too. 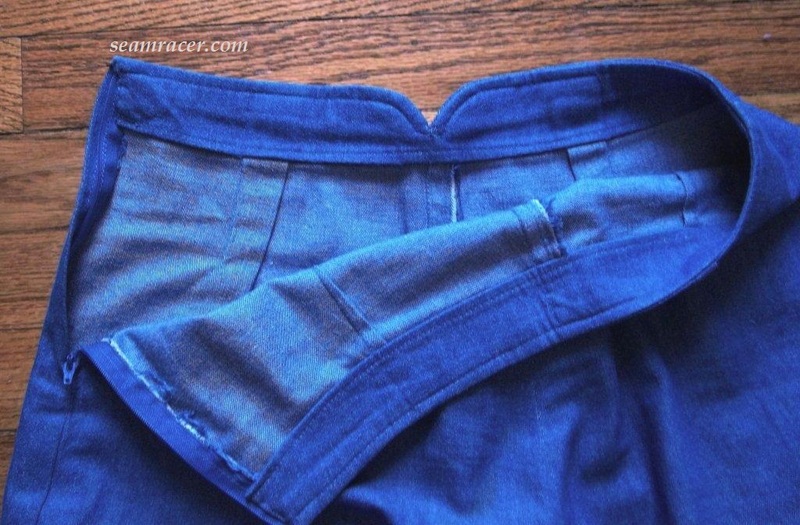 Three belt pieces were cut, two out of the purple cotton and one from the “Stitch Witchery”. 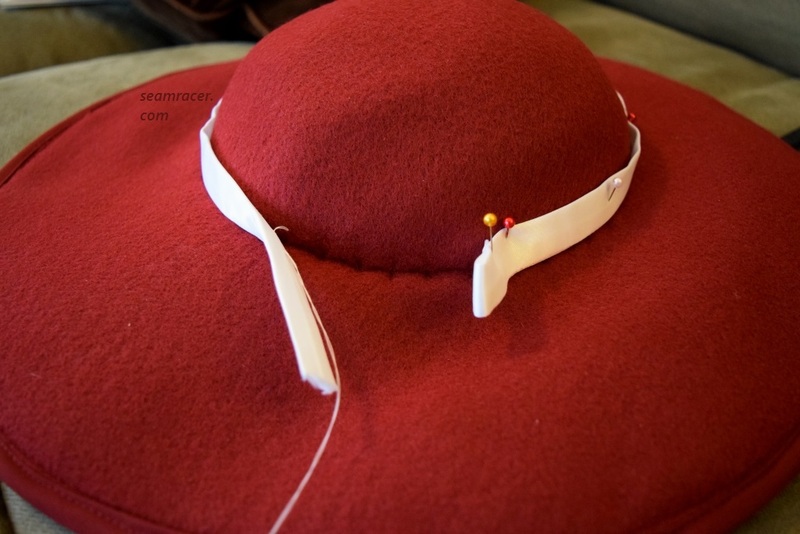 Then I sewed the belt as any tube or tie would be sewn, including top-stitching. The final step was the ironing process which fuses all the layers and sets the belt into being one stable but flexible amazing “new” single piece of belting. Luckily, the belt was exactly the size of a sliding insert style of belt from my stash. 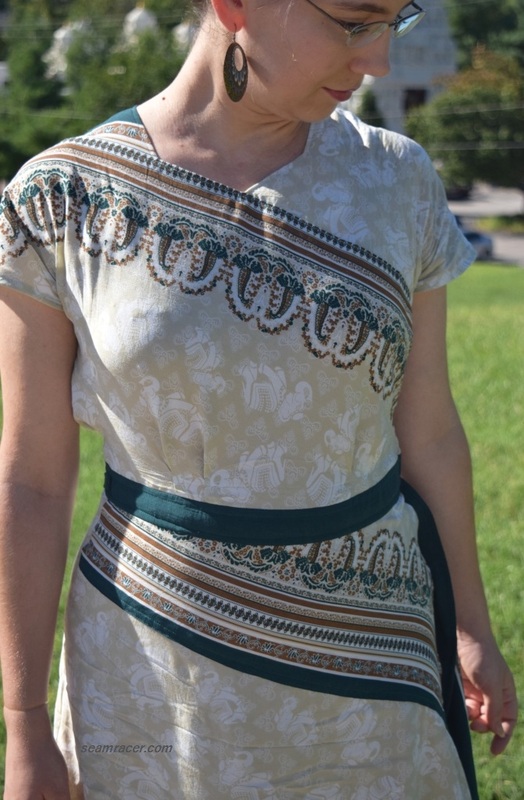 The buckle might be fairly new, but it was a low-shine, low-key silver color to provide a neutral balance to the two bold colors of my 1947 dress. Color blocking strikes me as holding a very odd, but special place in the history of the fashion world. It appears that pairing two different solid colors, whether in the same color group of not, has been around for quite many decades, and it still always has the ability to seem fresh and new. 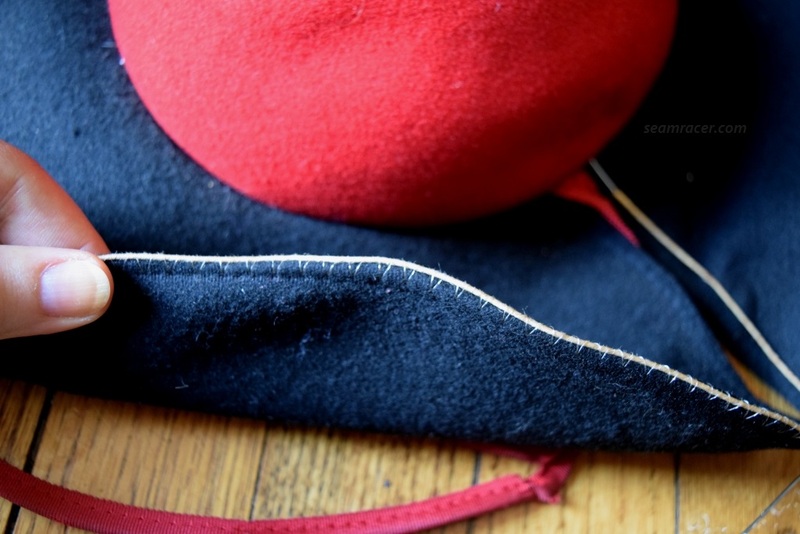 Of course, the ways in which the colors were used on garments has changed a bit. 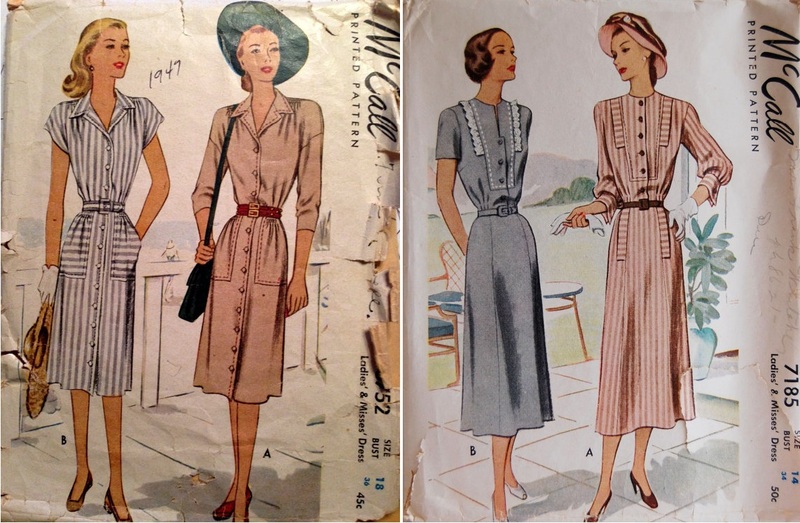 Not until the 20’s, 30’s, 40’s, and especially 60’s did different tones get assigned to panels and sections which are part of the clothing’s’ construction rather than layering contrasting tones of separate pieces of clothing like in past centuries. For some ideas of color blocking from the past, see this Pinterest page. 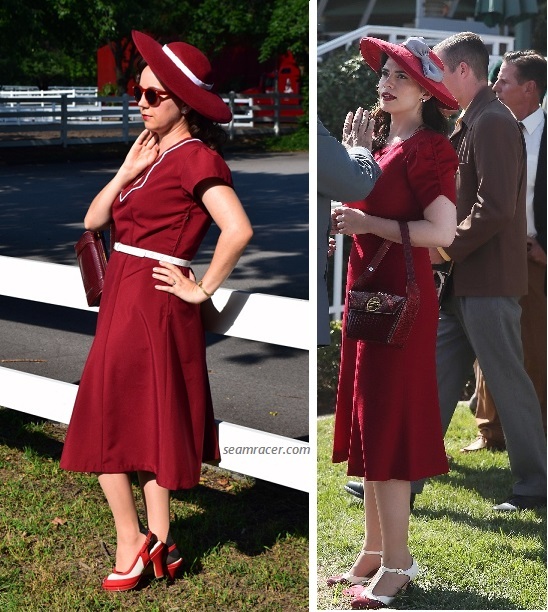 Peggy Carter, from Marvel’s “Agent Carter” TV series, wears an amazing color stepped dress that is actually a vintage 40’s original. 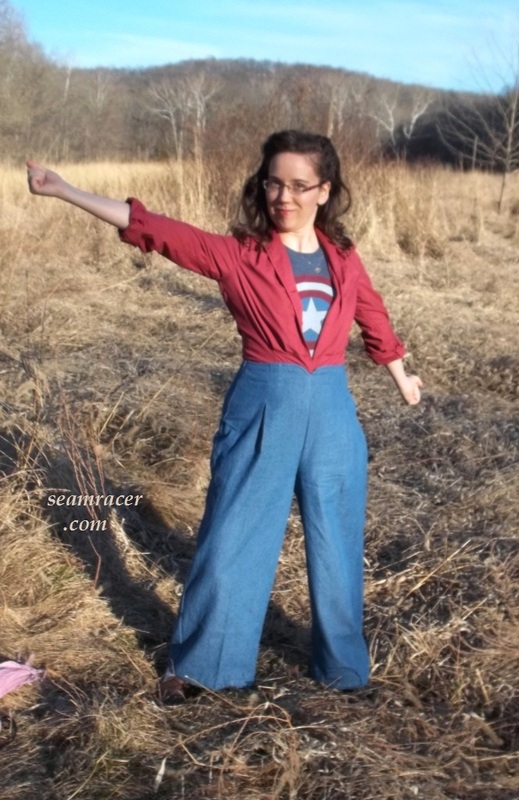 It has a duo of patriotic “Captain America” colors – cranberry red and dark navy blue – which run horizontally across a wide waist cummerbund. 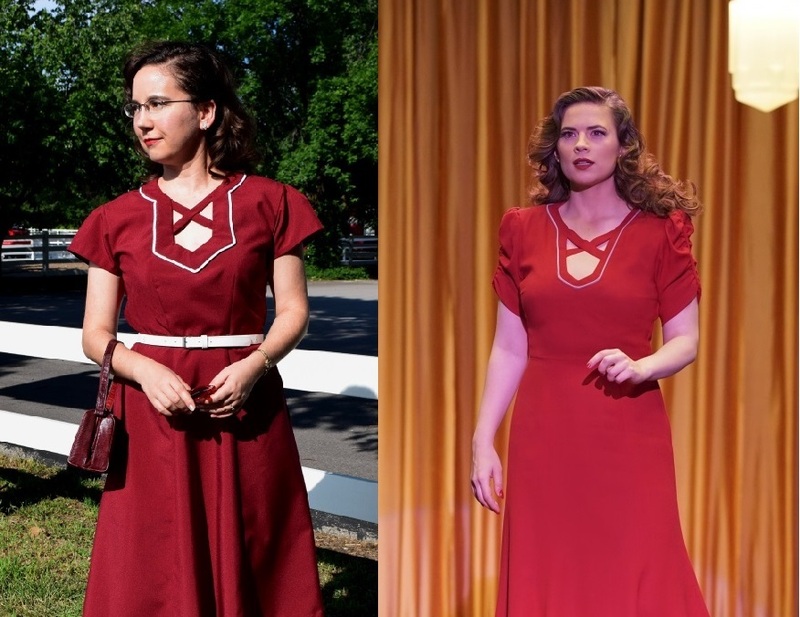 There is an excellent video on Marvel.com (found here at this link) where you can see this dress in reality, and see the rest of Peggy’s wardrobe closet. 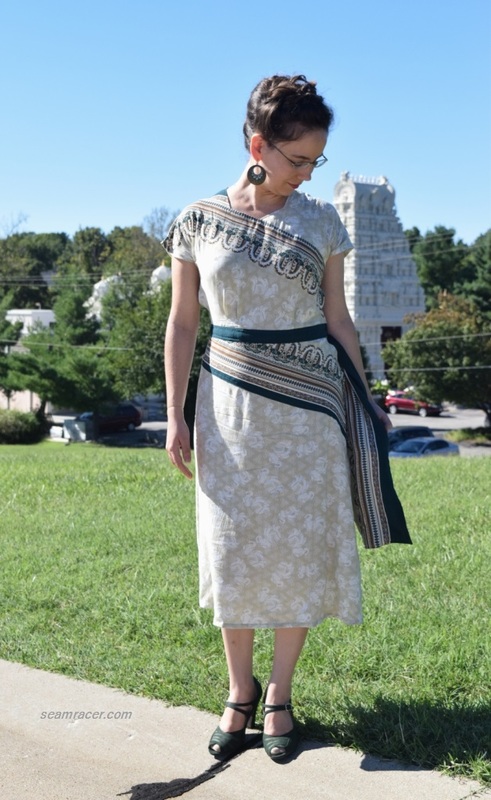 Apparently the waist cummerbund is attached to the front part of the dress, and, after studying pictures, I have also noticed several rows of runching below the center of the contrast bias neckline. 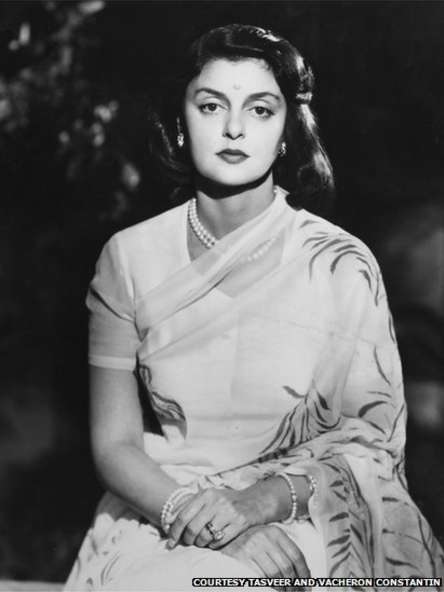 The neckline detailing and her sleeves makes me guess that this dress is from about the year 1944 or earlier. 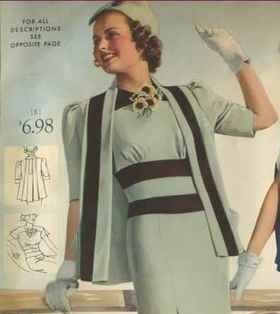 (See the right 1938 ad for a very similar color blocked dress.) 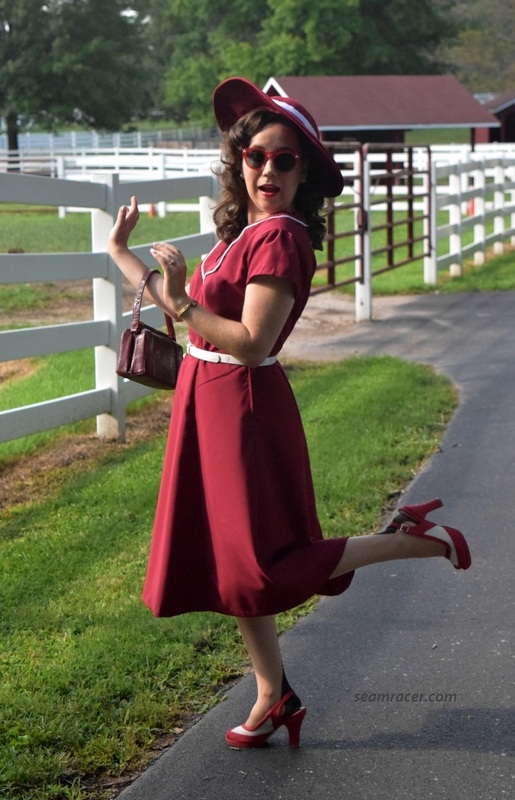 She is stuck in the life she had during the war, so wearing a dress that might be a few years old (the TV show takes place in 1946) would make sense for her character. 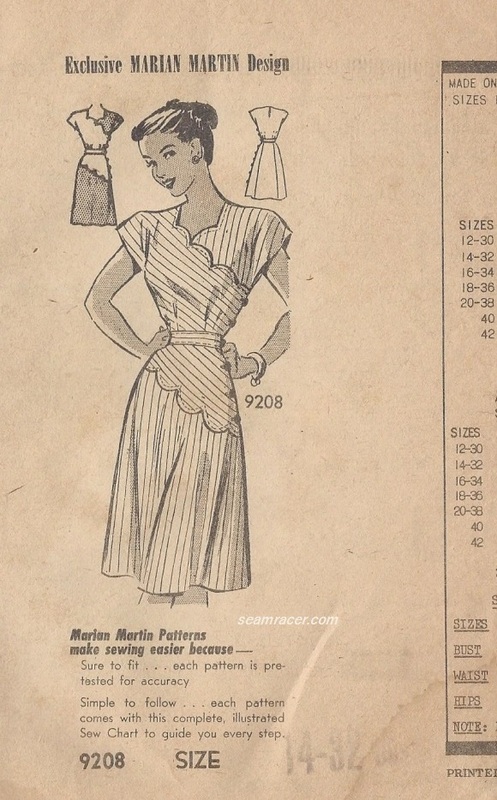 Nevertheless, her dress is beautiful, and I challenge someone to use a pattern like Simplicity #1692 (a year 1944 reprint) to make a knock-off copy…I hope to make one myself at some point!